When I was 5 years old, I remember walking into the music store, and immediately seeing hundreds of different instruments that were all foreign to me at the time. My Mother talked to the manager about purchasing a piano, while I explored all of the different instruments, getting a feel for each one individually. In that moment, I decided that instruments were something that I really found a natural passion for. This is the reason why I now play not only the piano, but also the guitar, and violin, and am self-taught in various other instruments as well. For this reason, I jumped at the opportunity to 3D print instruments. As I explored the idea of designing my first 3D printed instrument, I had many questions and doubts. How do I alter the size to compensate for the material? Will the characteristics of a normally constructed instrument translate directly to that of a 3D printed instrument? Would it even work? I took all of those questions into consideration, and through extensive research, I decided to design and print the most simple, straight forward instrument possible: a recorder. You can download & print the recorder on Sketchfab here. Recorders date back to the early 18th century, and are still used today in elementary schools all over the nation. Do you remember playing “Hot Cross Buns” and “Mary Had a Little Lamb” on that small plastic flute? There’s your classic recorder. Traditional medieval and baroque recorders are carved out of wood by a skilled luthier, but are now mass produced in factories, usually being made out of a plastic alloy. 3D printing an instrument, is in a way, a bridge between traditional production, and factory production. It allows for the precision and quality produced by a luthier to be expressed, while truncating the large time and labor-intensive factors that factory production targets. The final product that I created, is a combination of a recorder, folk whistle, and flute. 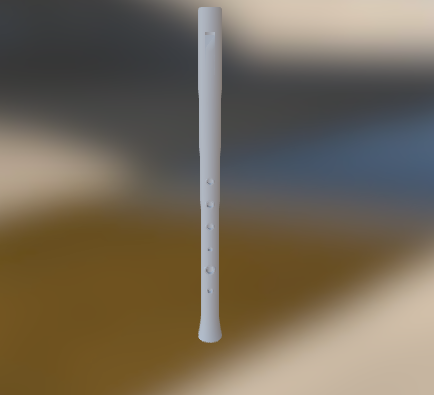 Its tones and overall shape come from the recorder, the fact that it’s produced in one piece only (thanks to the GigaBot) and its various hole sizes are derived from the folk whistle, and its long, slender form, originates from the flute. It works fairly well, being able to play “Hot Cross Buns,” and “Jingle Bells,” but with a few small upgrades and changes, it will be able to play louder, produce a more clear tone, and have a wider range of tone, as opposed to the more muffled, and slightly flat tone it produces now. 3D printing instruments like recorders, violins, guitars, and other instruments can be very helpful to our musical society. It allows for instruments that must be created one at a time by skilled luthiers, to be created by these precise 3D printers, while still being able to produce the same great sound. The amount of potential associated with the ability to 3D print instruments at home is unmeasurable. Not only does it reduce the amount of time taken to produce, (being built by a luthier versus being 3D printed) but it also opens the doors to a revolution in instrument material. Materials that could not be used by a luthier to make an instrument could be integrated into a 3D printer to create new, unique sounds that a traditionally produced instrument is not capable of making. I learned, while creating this recorder, that there are many different variables and outside factors that go into making an instrument. Rather than tackling them all at once, it is both easier, and more efficient to start with implementing the most basic characteristics, and then working your way up.